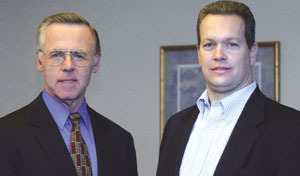 Richard Knop (left) and John Allen, co-CEOs of the Windsor Group, said their capital fund can be used to help small, disadvantaged 8(a) businesses. The Windsor Group LLC has launched an investment fund that will provide both cash and expert advice to small and midsized government services companies. The investment bank has recruited as investors 35 senior-level industry executives, many of them long-time players who have sold companies or retired but now stand ready as mentors to companies receiving the funds. Among the investors are Philip Odeen, former chairman of TRW Inc., Paul Lombardi, former chief executive officer of DynCorp, Jim Frey, former president of TASC, Dan Young, former CEO of Federal Data Corp.; Shiv Krishnan, CEO of Indus Corp.; and Kam Chainani, CEO of FC Business Systems Inc.
"The uniqueness of the fund is who the investors are," said Richard Knop, Windsor Group's chairman and co-chief executive officer. "Companies will get help and advice from someone who's got experience, who's got access to government customers and who can give them credibility in the industry." The Reston, Va., firm has raised $15 million for Windsor Capital Partners Fund I LLC, with a goal of reaching $20 million, Knop said. The capital fund is an affiliate of the Windsor Group, which also is investing some of its own money in the fund. Knop expects the fund to make investments of about $1 million to $4 million in seven to 10 companies. Companies targeted for investment will have revenue between $5 million and $100 million, with the typical company having about $20 million to $30 million, said John Allen, co-CEO. Windsor Group does not intend to invest in startup companies, but will assist companies that have a proven track record and potential for success, he said. Windsor Group expects to invest in one or two companies this year. "We don't see a lot of risk in these investments," Knop said. "We're looking for companies that are well-managed and have profits." A company might use the money to make an acquisition, retire debt, buy out a partner or supplement commercial bank financing. The goal is to help companies grow and succeed in the federal market. "Bigger is better for these companies. Their valuations get higher as the companies get larger," Allen said. Windsor Group is no stranger to the government market. The firm represented International Consultants Inc., purchased by MTC Technologies Inc. in October 2003; C-Cubed Corp., purchased by CACI International Inc. in September; and DDD Co., purchased by Pitney Bowes Inc. in August. In the 12-month period from October 2002 to October 2003, Windsor Group participated in 12 deals in the government space worth $640 million, Allen said. More deals are in the works. Other capital funds, such as Arlington Capital Partners, Caxton-Iseman Capital Inc., the Carlyle Group, CM Equity Partners and Frontenac also have made strategic investments in federal IT companies. In April, for example, Arlington Capital invested $75 million to begin a rollup of government IT services companies. It initially purchased ITS Services Inc. of Springfield, Va., a company that specializes in enterprise architecture, network services and applications development. ITS Services in January announced plans to acquire Science & Engineering Associates Inc. of New Orleans to create a company with about $200 million in annual revenue. Odeen, one of the Windsor Fund investors, serves as ITS' chairman. Unlike Capital Partners and other capital funds, the Windsor fund will be focused solely on small defense and government IT services companies, and the investments will be much smaller, Knop and Allen said. They also might partner with a large capital fund. A major benefit of the fund will be the participation of current and former CEOs, who want to stay involved and help new companies. "It's capital with an extra kicker," Allen said. Although companies won't be required to use the investors as advisers, Knop and Allen think most young executives would jump at the chance to have someone such as Odeen on their board of directors or in some advisory role. "They can give advice and open doors to customers and partners," Knop said. The fund especially could help small and disadvantaged companies make the transition out of the 8(a) program to open competition, Knop said. Such companies, for example, need advice on how to change their marketing strategies. "About 20 percent to 25 percent of the fund's investors come from the 8(a) world and really want to give back," Knop said. Editor Steve LeSueur can be reached at slesueur@postnewsweektech.com.